Faulty fi system is often related to poor electrical contact of connector/coupler. 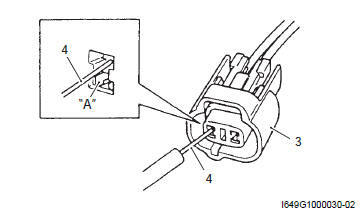 Before servicing individual electronic part, check electrical contact of the connector/coupler. When connecting a connector, be sure to push it in until a click is felt. With a lock type coupler, be sure to release the lock when disconnecting, and push it in fully to engage the lock when connecting. When disconnecting the coupler, be sure to hold the coupler body and do not pull the lead wires. Inspect each terminal on the connector/coupler for looseness or bending. Push in the coupler straightly. 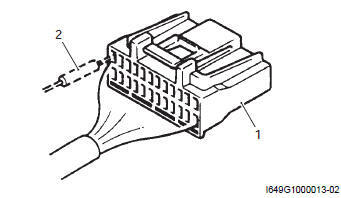 An angled or skewed insertion may cause the terminal to be deformed, possibly resulting in poor electrical contact. Inspect each terminal for corrosion and contamination. The terminals must be clean and free of any foreign material which could impede proper terminal contact. Before refitting the sealed coupler, make sure its seal rubber is positioned properly. The seal rubber may possibly come off the position during disconnecting work and if the coupler is refitted with the seal rubber improperly positioned, it may result in poor water sealing. Inspect each lead wire circuit for poor connection by shaking it by hand lightly. If any abnormal condition is found, repair or replace. When taking measurements at electrical connectors using a tester probe, be sure to insert the probe from the wire harness side (rear) of the connector/coupler. When connecting meter probe from the terminal side of the coupler (where connection from harness side not being possible), use extra care not to force and cause the male terminal to bend or the female terminal to open. Connect the probe as shown to avoid opening of female terminal. Never push in the probe where male terminal is supposed to fit. Check the male connector for bend and female connector for excessive opening. Also check the coupler for locking (looseness), corrosion, dust, etc. Avoid applying grease or other similar material to connector/coupler terminals to prevent electric trouble.